When you choose a dining table for your home, you put impressive efforts, and you will never want the surface to get damage. 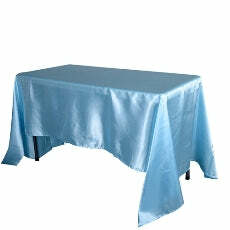 A tablecloth comes as the rescuer of your table from the stains, scratches or spills. As the selection of your dining table is important, likewise the tablecloth needs to be picked as per the shape and size of the table. Tablecloths make it easy to clean up the mess on the dining tables. BB Crafts offers a wide selection of rectangular tablecloths for your beautiful dining space. You can find them in an array of gorgeous colors and sizes. Choose the one that matches your decor theme and occasion. These pieces will make a statement for you. Enjoy the versatility and beauty of these rectangular tablecloths and select from the exclusive collection of the beautiful range offered by BB Crafts at great prices.